Someone out there has incriminating photos of the Emmy voting committee. Either that or the world is coming to an end. The awful truth about Emmy nominations. I wasn’t expecting all my “dream nominations” to become a reality, but I was not ready for what actually happened either. If you want to ignore the harsh reality a little longer, you can check my “Fantasy Nominations” for DRAMA and COMEDY. OK OK, I don’t really want anyone to die, so don’t alert the authorities yet. However I would not be against some gentle beating of whoever picked the Emmy nods this year. I personally believe Dexter deserved some Emmy recognition; either for the show, Michael C. Hall and/or Jennifer Carpenter. But above all I CANNOT believe Hannibal didn’t get any important nods. Do they realize this show is THE BEST thing on broadcast TV right now? Apparently they don’t. I can’t believe such a masterpiece was ignored while other broadcast shows like Nashville, Scandal, The Big Bang Theory and The Good Wife managed to score nods (not saying these shows are bad or undeserving, just pointing out that if Emmy voters are willing to consider broadcast series they SHOULD take Hannibal into account). Exactly how many versions of one character an actor needs to play to get an Emmy nod? This is the last year I’ll get the chance to say this WHY WON’T THEY GIVE JOHN NOBLE AN EMMY? Seriously, why? 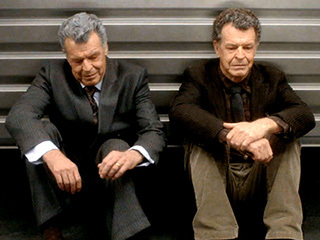 He not only played the character of Walter Bishop masterfully for 5 years, but he also took on his alter ego “Walternate”. No matter what they say, I’ll forever consider his performance as one of the greatest on TV. Furthermore, for the life of me I can’t understand why they didn’t nominate Tatiana Maslany from Orphan Black. She literally carries the show since she plays most of the characters, ranging from a punk to a suburban housewife. Playing multiple characters worked for Toni Collette a couple years ago (United States of Tara), so I cannot understand what happened here. I was very surprised of two previously loved shows that were ignored this year: Boardwalk Empire and New Girl. The prohibition drama only got one nod for Bobby Cannavale (yeah, no Steve Buscemi!). On the comedy side New Girl was completely ignored. I actually predicted nominations for Zooey Deschanel, Max Greenfield and Jake Johnson. I think at least one of those three was deserving of a nod. I’ll let you decide which one. Unfortunately, other predictions came true. Sons of Anarchy was once again ignored, failing to get a nod even for veteran actress Katey Sagal or Walton Goggins (Best guest star inthe history of TV). And while we are on the subject, Walton Goggins was deserving of a Supporting Actor nod for Justified as well. In addition looks like Banshee will follow SOA’s path and will forever be ignored from award ceremonies. But Banshee is too crazy, you say… It didn’t stop voters from nominating True Blood before. I am a HUGE Downton Abbey fan, I love Homeland and Modern Family always makes me laugh. Nevertheless, I thought they over-nominated those shows. I think nominating the show and Maggie Smith should have been enough for Downton Abbey. For Homeland I would have accepted Claire Danes, for sure, plus Mandi Patinkin. Finally, Modern Family… Just pick one actor voters! You don’t have the obligation to nominate the entire cast every year! Don’t get me wrong, I love these shows and their casts, but nominating EVERYBODY just makes the categories repetitive and takes away the chance to recognize new shows and fresh faces (and sometimes old faces that should be recognized). Also I would have loved double nominations for the real life married couple of Claire Danes and Hugh Dancy (Hannibal). I would have nominated Hugh instead of Damian Lewis any time. It was obviously not bad to see Aaron Paul and Neil Patrick Harris on stage but other than that, I think I can count with one hand the nominations I am thrilled about. I wanted 30 Rock to have a well deserved farewell so I won’t complain about Tina Fey, Alec Baldwin and Jane Krakowski’s nominations. I am excited about the rise of online originals. I think all the nominations for House of Cards were well deserved; however, I am a little surprised Kate Mara didn’t get a nod. It also looks like it is Elizabeth Moss’s year. She got two nominations for her roles on Mad Men and Top of the Lake. Both top notch performances. I predict she will go home with at least one Emmy if not two. I am relieved Breaking Bad got nods in all the important categories and even a shocking one for Jonathan Banks. Oh, Mike R.I.P., I love you! But still… I would have given his spot to John Noble in a heartbeat. Finally, there were some really surprising nominations that weren’t entirely bad. I thought they were going to ignore Game of Thrones completely. But they actually nominated the show and my favorite supporting actor ever Peter Dinklage. Most shockingly though, they nominated Emilia Clarke for best supporting actress. I did not see that coming, but go Khaleese! She is amazing. I will, however, complain about them ignoring Michelle Fairley! Have you seen the Red Wedding episode?! Hello! That had EMMY written all over, but at least they didn’t ignore the show completely… The most shocking nomination, in my opinion, was Kerry Washington. I didn’t even consider the possibility of her nomination so I was genuinely shocked and… I have to say pleasantly surprised. I think Scandal is a great show, Kerry is wonderful on it and I welcome the surprise as everything else was boring and predictable. HOWEVER, in no way I consider her performance better than Tatiana Maslany’s! Same goes for Connie Britton; I love her, she is great but Nashville is not the awesome show critics like to believe it is. It is good but it is not the most original amazing thing on TV. Orphan Black, on the other hand… IS. My final complaint is Emmy voters ignoring Community once again. If the show is just too weird and quirky for voters, at least they should nominate someone from the cast. They are all truly great comic actors. For God’s sake, nominate Alison Brie because you know her from Mad Men or something.